People usually visit with their friends, which is a good idea because Liquids' entire decor is designed so your group has enough privacy. The look of the place is uber-lounge, bead-and-mirror curtains, low sofas scattered casually about and a peaceful Buddha in the midst of it all. The one incongruity is the rather loud music, but nobody seems to mind this. The popular DJ Ajay, erstwhile T2 music-mixer, plays all the crowd favorites, plus a couple of new international hits to shake things up every now and again. After it opened in mid-2003, this pub was, for quite a while, the place to be seen at. So every Saturday night would find a curious mix of teeny-boppers and crowded regulars, all eyeing each other discreetly to see if P3 was there. 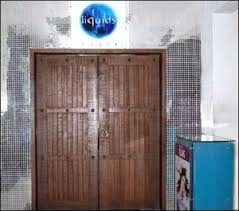 Even though it's still one of the hottest pubs on the circuit right now, Liquids has more or less settled to a guest-list of regulars and out-of-towners. Except, of course, when the occasional hot DJ or model comes a-visiting (read Katrina Kaif): translation - complete chaos.